Comment: Rear gutter is bent and pulling away from siding. Attached to the gutter is a piece of wood that separates the gutter from the siding. The wood needs to be reattached and the gutter repaired or replaced. Comment: I would like to get an estimate for replacing the front approximately 30 to 31 feet in length. Only one downspout needed. Comment: I would like to get an estimate for installing gutter covers on home. provide leaf screens on gutters. Comment: our gutters are falling off in two sections on the house, the fascia is awfully ugly, I would like to get quotes on replacing the soffit, fascia, and gutters for the house and attached garage. Comment: Had new roof put on. Just checking on pricing for new gutters. Florissant Gutter Cleaning & Repair Services are rated 4.69 out of 5 based on 361 reviews of 15 pros. 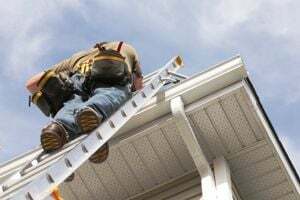 Not Looking for Gutters Contractors in Florissant, MO?